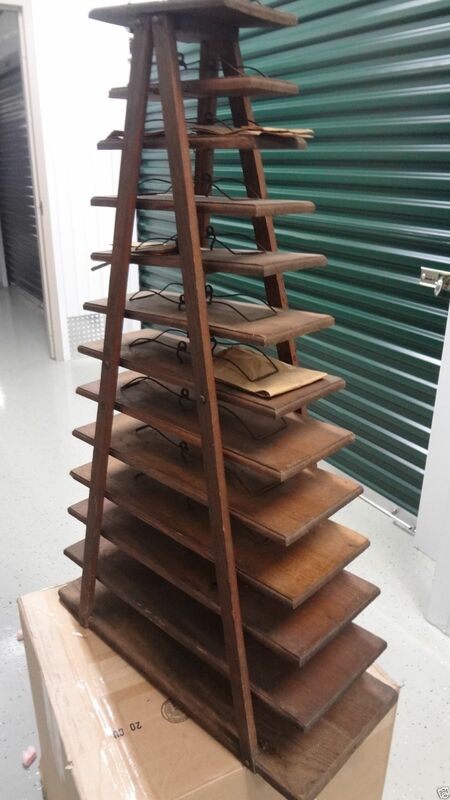 Rare Wooden country store counter top tiered paper bag rack holder. One of the nicest I’ve seen, quality made, and in excellent original condition, sturdy and structurally sound. 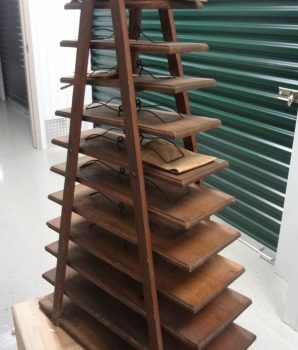 Many are wire rack type but to find a quality wooden stand is rare. This is a free standing unit that used to sit on the counter of the old country stores. The rack has tapered shelves are of graduated sizes to hold paper sacks of different dimensions. Has thirteen stepped wood shelves for different sized bags and wire snaps to keep backs in place and to pull one bag at a time. Some of the bag sizes are marked on the side of the wood frame i.e.…5, 6, 8 etc. The dimensions: 39″ H x 9 3/4 ” W x 23 1/2″ D .